So you have decided to get married in Spain and everything is now booked but there is one small but very important item on your wedding checklist that you haven’t got round to sorting out; your hair and make up. There are lots of hair and make up artists that work in Spain, however some brides prefer to do their own hair and make up so to get the right look brides are now opting to have lessons so they can complete their own wedding look. 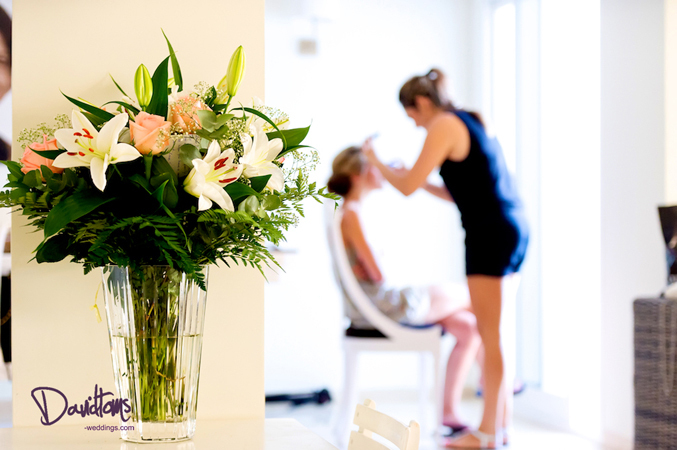 One of the upsides of having your wedding in Spain is that the Spanish wedding venues tend to hold their ceremonies much later on in the day, this allows a bride to relax with her bridesmaids and have more time and fun whilst creating their individual hair and make up styles. I spoke to Maxine Warner, a hair and make up artist from Essex, who provided one of the Sunshine Weddings Spain bride’s and her bridesmaids a bespoke hair and make up wedding package so they could create their own wedding look. “The first thing a bride should think about if she has decided to have her wedding in Spain is her wedding location. If she is opting for a beach wedding then she would normally choose a natural sun-kissed look, or if her wedding is set in a rustic Spanish wedding venue such as a Finca or Hacienda set in the countryside, then she might like to opt for a style that is a little more dramatic. Its always a good idea to have some photos so we can work together to create and achieve the right vision. This bride in particular wanted to obtain a soft pretty romantic look with a pretty hair piece to compliment her outside Mid Summer Nights theme. Together we discussed and played around with different styles which gave my bride a sense of total control over how she was going to look on the day; walking down a garden pathway shaded by trees and leafy plants, and set in the gardens of an old Spanish Hacienda in the Majorcan countryside. Bridesmaids are also taught how to work on each others hair and make up styles, and together they can have great fun with fabulous results bringing the wedding party even closer together making their day even more special. Once the design has been agreed one of the bridesmaids, or friend, is then taught how to achieve the style, whilst taking lots of pictures and drawing diagrams so they can practice before the wedding day. When working with make up, colours and shades are carefully chosen to go with the theme and colours of the wedding, and once agreed I work on one side of the brides face whilst her bridesmaid, or friend, works on the other. Hair & Make up trial, make sure this is 6-8 weeks before the wedding day to allow time to practice and perfect each look. Use MAC make up blotting paper it works well for Oily skin. Press the paper on to the skin, it will remove sweat and oil without disturbing the make up.